Last month, we bought a new house in a new town in a new state. House hunting (another topic for another post) finally paid off and on 4/4/14, we got the keys to our new digs. As you know, I am a list maker. All the time spent waiting for the contract exchange date, I was prioritizing items on my list. Here's what I came up with for the items that needed to be dealt with immediately. Change the locks and garage door opener - Unless you've built your house, someone else has or has had keys or an opener to your house. There are lock kits available to re-key existing locks and a garage door opener can also be re-keyed. Hang blinds or curtains for privacy - Sometimes the sellers leave the window coverings and sometimes they don't. If they don't, hang something up, even if it temporary so that you won't be the talk of the neighborhood in a not-so-positive way. Check existing fence for any holes - This is especially important if you have children or pets. Mend the holes, again, even if it is temporary. Make an emergency exit plan - You probably had a fire or emergency plan at your old house. There needs to be a new one at your new house. Change over utilities/cut off old utilities - You want to be able to turn on the lights and bask in the glow of your new home. Introduce yourself to your immediate neighbors - Knock on the doors of those people to your right, left, in front of you, and with anyone that you share a fence or border. A good first impression is a highly treasured thing. 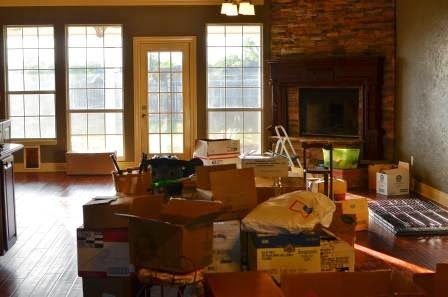 If at all possible, clean and paint before you move your stuff in - It will be so much easier than having to work around furniture. If that is not possible, at least consider not unpacking everything until the areas you want painted are fixed. Likewise, clean everything before you unpack - The only way to make sure that a house is cleaned up to your standard is to clean it yourself. So don't forget to have the cleaning supplies somewhere easily accessible. Bring in paper goods - Toilet paper is obvious but paper towels are also a must when moving house. We go through about 1-2 rolls of paper towels a year. Seriously. We never use them. But since moving, we have gone through nearly six rolls. Mainly because I don't want to have to constantly be washing rags when I could be doing other house projects. Same goes for paper dinnerware. This is part of WFMW. Amen to the last to do. Too many times I've forgotten to do that, and regretted it. If I was a realtor or an apartment manager, I would make sure that there was one roll of toilet paper, with a big bow on it, in the bathroom with a little card from me in every house. Wouldn't THAT leave an impression (and save a few people's behinds--litterally). What an absolutely BRILLIANT idea for realtors Ms. Gale! Great tips and can't wait to see your new place. Hope you share pics. Essential list...pinning for sure. So happy you're on your way. Blessing for a smooth move. I especially liked the changing of the locks thing. I definitely would do that!